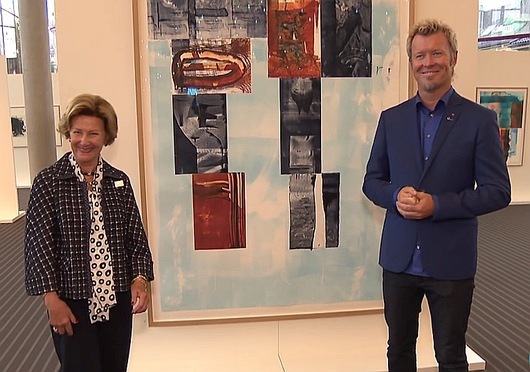 Magne was in Bergen last weekend, to present a joint exhibition with Her Majesty Queen Sonja. The two of them have been collaborating on a new series of prints over the last year and a half, which has resulted in an exhibition called Texture. Their work on Texture started in New York in April 2015, when they did three days of experimenting at the Universal Limited Art Editions workshop on Long Island. “Her personality and dedication to printmaking has allowed me to relate to her as a colleague and not as a queen. When we collaborated on prints, there was never any need to establish a set of roles. At the same time she wanted me to give her honest feedback”, Magne told A-magasinet on Friday, which featured a 12-page article about the project. As well as opening the exhibition, they could present a brand new coffe-table book about their artistic collaboration called Grafikkens vinger. The Norwegian edition of the book, which features text by Lars Saabye Christensen, can be ordered from bokkilden.no. The book will also be released internationally. The fifth season of NRK1’s popular singing contest Stjernekamp kicked off tonight, with Tomine Harket as one of the contestants. Stjernekamp is a live show where established artists and younger talents perform songs from a different music genre each week. The theme this week was Norwegian rock and Tomine had chosen to perform “Hjerteknuser” by Kaizers Orchestra. Morten was in the audience to show his support, like he’s been on several occasions before. The theme next week is country music, and Tomine will be performing “Folsom Prison Blues” by Johnny Cash. Tonight’s episode is available to watch at nrk.no. In addition to Stjernekamp, Tomine is currently enjoying success together with the rapper Unge Ferrari. Watch the music video for their latest single “Iblindeserenbedre” on YouTube. 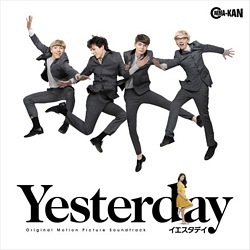 In connection with the release of the 2014 movie Beatles in Japan – where it’s called Yesterday – the film score by Magne Furuholmen will be released on CD and vinyl by the label Cinema-kan. The CD is set for release on 7 September, while a limited edition vinyl LP with a different cover will be out on 5 October. Magne’s score was only available digitally in Norway, so this is the first time it’s released in physical formats. Both the CD and the LP can be pre-ordered from amazon.co.jp. The movie itself premieres in Japan on 1 October.